When in Buzios leave your tourist ways behind and immerse in what this place has to offer. Life in Buzios is as beautiful as the resort itself. The natives have the privilege of catering to the rich and famous who find Buzios the perfect hideout for a peaceful vacation. Ever since Brigitte Bardot vacationed here in the mid-sixties the resort has transformed itself from a sleepy, colonial fishing village into a charming beach paradise and the hottest place to vacation in South America. The natives exude warmth and friendliness which is typical of all Brazilians. As tourist hotspot, many natives are engaged in the tourist industry. The rural inhabitants of Buzios are descendants of Native Indians and Portuguese known as 'Caiçaras'. Many natives are engaged in fishing for their livelihood where their catch is sold in the local market. Others are involved in tourism-related activities such as housekeeping, tourist guides and handicrafts that are sold locally in shops. Today, several American and European nationals have made Buzios their permanent home, many running their own establishments amongst Buzios’ restaurant scene. 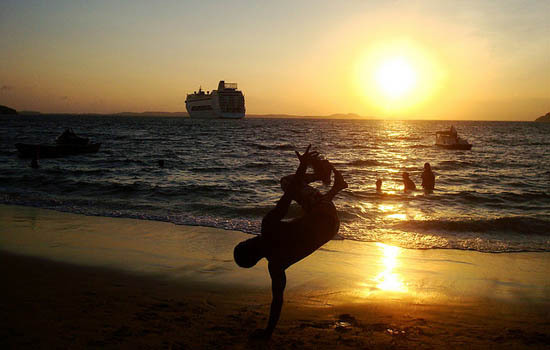 Young locals light up the town at night with many engaged in capoeira, an afro-Brazilian martial art form that features a combination of martial arts, music and dance. The dance is more a performance piece than a recreational activity. The artistry and gymnastic ability of the dancers is an amazing sight to watch as they move to the rhythms of the beat, providing a deep connection between the musician’s and the dancer’s body. The relaxed attitude of the locals definitely rubs off onto the tourists who learn to relax casually, dine casually and then party at night. Caipirinhas, a drink made from fermented lime and sugarcane, is the order of the day, whether you are a local, screen-goddess, celebrity or a footloose and fancy-free backpacker. Along with the natives, you can relax, have fun on the beach and enjoy some excellent shopping, dining and nightlife. As the rush is huge during season, you will have to plan well before to avoid problems with accommodation, for exemple.There are always visitors in Buzios, even during the low season so make your plans in advance.